Orlaya grandiflora looking very dashing this morning. 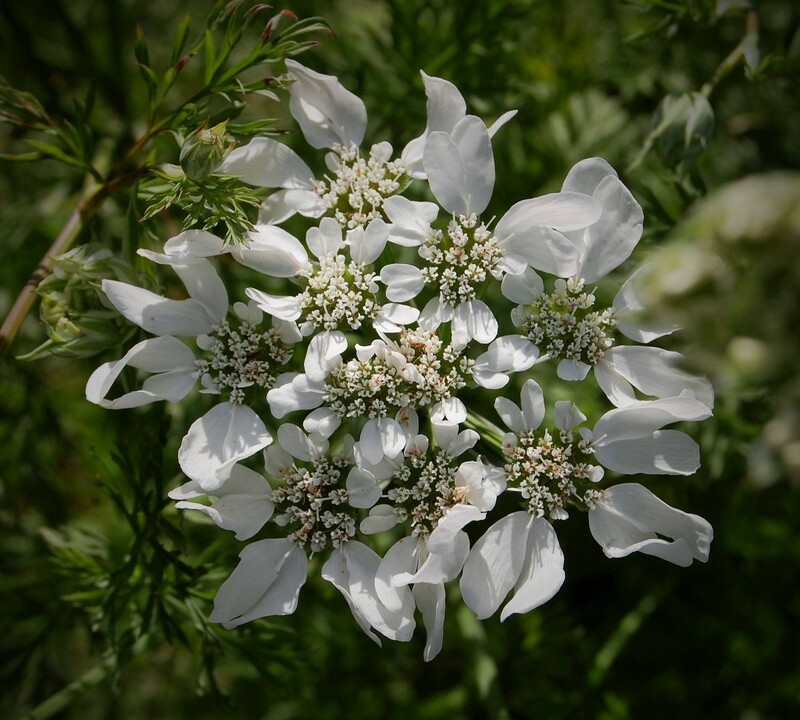 Orlaya Grandiflora is a cousin of the wonderfully useful Ammi Majus, a mysterious, sophisticated and saucy cousin…the kind of girl a chap would like to meet out on the balcony during a ball at a Russian palace. She is a most distinctive annual with pure white umbels which seem to hover over a delicate and much divided fern like foliage. A very soothing addition to the garden or cut flower patch. You can’t have too much of Orlaya. Being a hardy annual you can make an Autumn sowing which will give you stronger plants earlier the following year or you can sow in the spring and thou shalt have it flowering until the frosts. I do both…I’m greedy and I don’t care who knows it. Orlaya Grandiflora may well be lovely but she is also a bit of a handful… Her temperamentality starts at birth. Germinating the seeds can be erratic but there will always be successes…you’ve got to roll with the punches. If you wish to sow in Autumn I suggest you sow it in pots and keep them in a cold frame or green house over winter. They need to grow a good root ball to survive. As your green house shouldn’t be too full during the winter you can afford to use largeish pots. I use six inch pots. In the early spring, harden them off and plant them outside to a spacing of about a foot and a half. My Aunt Betsy said you should think nice thoughts when you plant them as they grow prettier flowers but then Aunt Betsy spent the last twelve months of her life thinking she was a unicorn and telling me the moon was making her hooves itch. The plant in the photograph has been grown in a builder’s bucket (with holes put in)…I sowed the seeds in early April and kept the bucket in the greenhouse until after germination. Orlaya seeds need to be sown on the surface as they need light to germinate. Sunday Night Picture Show…Solstice. The Sunday Night Picture Show. End Of June.